Have you ever felt like there was just something missing from Girls? 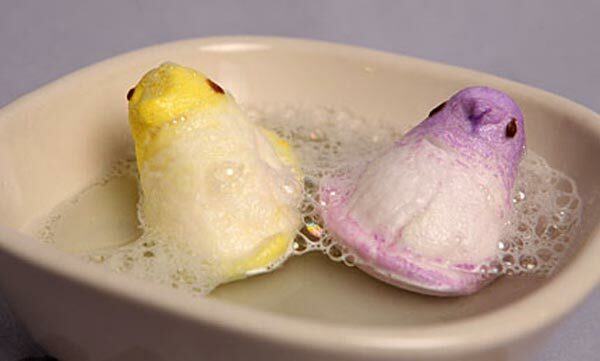 We're thinking what you're thinking: That show needs more Peeps. And we don't mean it like "hey, where are my peeps?" We mean Peeps. The candy. Honestly, how many people exist in Brooklyn in 2013 who don't have at least one friend who's a sugar-covered marshmallow bird? None. Clearly. Seriously, though, whether or you love the show or love to hate it, this re-imagining of Lena Dunham's breakout hit is everything you ever wanted from the venerable tradition of Peep dioramas. As you can see, this amazing work of art on Epicurious covers everything from Marnie's plastic dress to Hannah's bath with Jessa — and it's just great. If you thought thoroughly, intensely enjoying Easter was kid stuff, you thought wrong. Read this, print it out, and distribute it to your relatives as an informational pamphlet. Go.